Chicago drug maker AbbVie is a big step closer to slashing its tax bill: Its U.K. takeover target, Shire, said it would recommend accepting a new, higher bid. That would enable AbbVie (ABBV) to switch its home base to the U.K. and pay a lower rate of tax. The latest bid of £31.4 billion pounds ($54 billion) is the fifth since early May, and is 35% higher than the original offer. AbbVie thinks it can achieve a "competitive tax domicile" by moving its base to the U.K., where the rate of corporate tax will be just 20% beginning next April. That's down from 26% in 2011. The U.S. rate is 35%. The merged company would keep its operational HQ in Chicago and would continue to be listed on the New York Stock Exchange. But crucially, Shire (SHPG) shareholders would own about 25% of the new company, meeting one of the conditions U.S. authorities have set to prevent companies simply moving overseas to escape higher taxes. Relocating to the U.K. is not as simple as opening an office in London and telling authorities your tax base has changed. A U.S. company can only really move to a more tax-friendly nation through a process known as "inversion," where acquisition activity leads a foreign partner to own more than 20% of the stock in the merged entity, among other requirements. Shire said Monday there was still no guarantee the deal will go through. 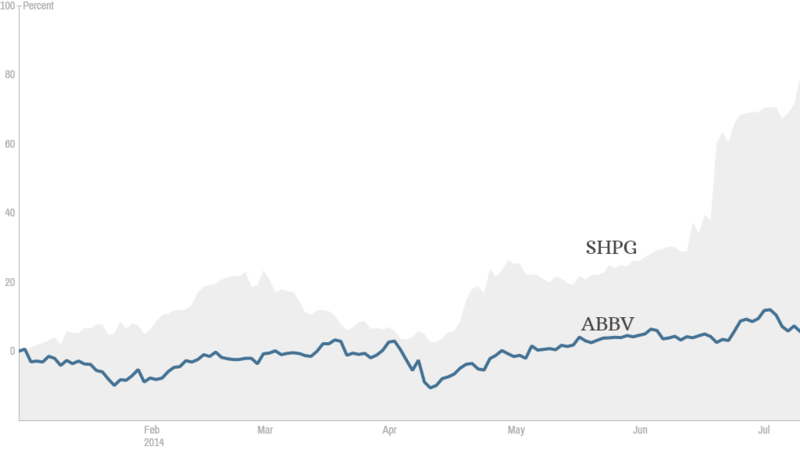 But if it does, AbbVie will have succeeded where its much bigger rival Pfizer (PFE) failed. Pfizer offered more than $100 billion to buy AstraZeneca (AZN), and made plain that "significant" tax savings were one of the main drivers of the failed takeover bid.